This tutorial is designed for you to gain a better understanding of the DJI Bridge App. It will teach you how to use it for app debugging by implementing the live video view and two basic camera functionalities: "Take Photo" and "Record video". You can download and install the DJI SDK Bridge App from App Store to your mobile device. The design of the DJI Bridge App is simple. It's a universal app supports both iPhone and iPad. You can use it to debug app for Phantom 3 Professional, Phantom 3 Advanced, Inspire 1, M100 and other products using USB/MFI connection between RC and your app. As you see above, the Bridge App and the iOS Device or Xcode Simulator should work in the same local network using TCP service to communicate. You can connect them to the same WiFi network or connect to a local wireless connection created on your Mac too. At the top of the screen, there are two signal lights, which represent the connection between the bridge app and the remote controller or your application. When the bridge app connect to the remote controller successfully, the RC light will turn green. Similarly, when the bridge app connect to your app successfully, the App Light will turn green too. The bridge app uses TCP sockets to communicate with your app. It use Debug Id to distinguish between different bridge apps running on different mobile devices. TCP connection is stable and supports security network, which means your local network has firewall. The debug ID will change in different IP addresses. Now try to open the bridge app, and connect your mobile device to the remote controller using usb cable, you should see the RC Light turn green! If you connect the bridge app to the RC and the RC light is still red, you may need to restart the app and try again. It should works. If the bridge app cannot connect to your app successfully because of switching your mobile device's wifi network or other unknown situations, you can press the Link Reset button at the bottom to force restart the TCP service to refresh the Debug ID. Now, let's create a new project in Xcode, choose Single View Application template for your project and press "Next", then enter "BridgeAppDemo" in the Product Name field and keep the other default settings. Once the project is created, let's import the DJISDK.framework to it. If you are not familiar with the process of importing and activating DJI SDK, please check this tutorial: Importing and Activating DJI SDK in Xcode Project for details. 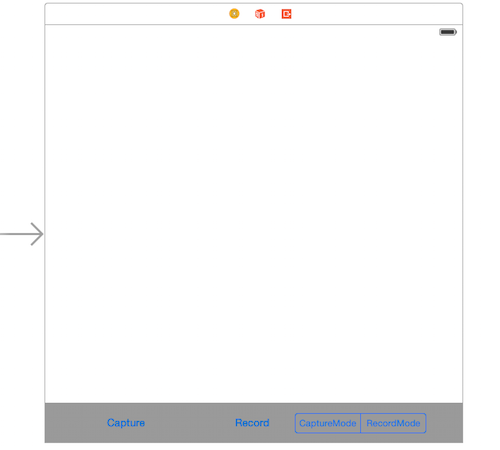 You can check this tutorial Creating a Camera Application to learn how to download and import the DJIWidget into your Xcode project. The delegate method above is called when SDK detects a product. Then invoke the fetchCamera method to fetch the updated DJICamera object. 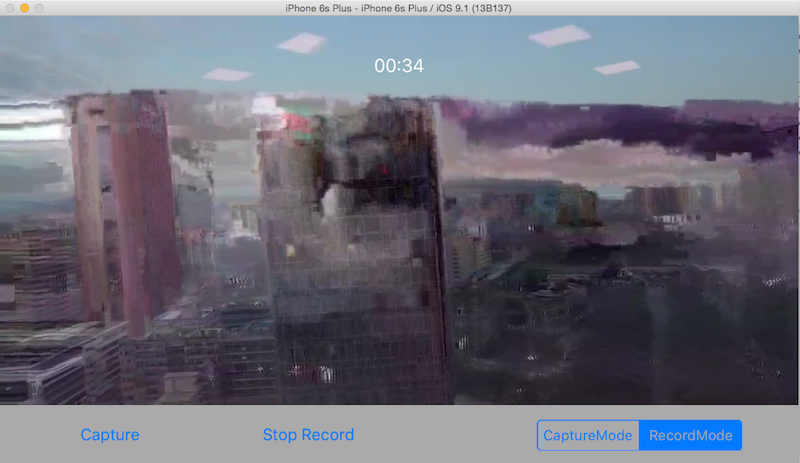 The videoFeed:didUpdateVideoData: method is used to send the video stream to DJIVideoPreviewer to decode. //Please enter your App key in the "DJISDKAppKey" key in info.plist file. Note: If you don't know how to apply as a DJI developer and get the App Key, please refer to Get Started. The delegate method above gets called when the app is registered. If the registration is successful, we can call the enableBridgeModeWithBridgeAppIP: class method of DJISDKManager to enter debug mode of the SDK by passing the bridgeAppIP parameter, which you can get from the Bridge App. Then add the listener for the primaryVideoFeed of videoFeeder in DJISDKManager and call the start method of the DJIVideoPreviewer class to start video decoding. 3. Build and Run the project in Xcode. If everything is OK, you will see a "Register App Successed!" alert once the application loads. 1. First, turn on your remote controller and connect it to the mobile device which is running the DJIBridge app. 2. Trust the device if an alert asking “Do you trust this device” comes up. 3. Make sure your mobile device connect to the same WiFi network to your Mac. 4. Then, turn on the power of the aircraft. 5. 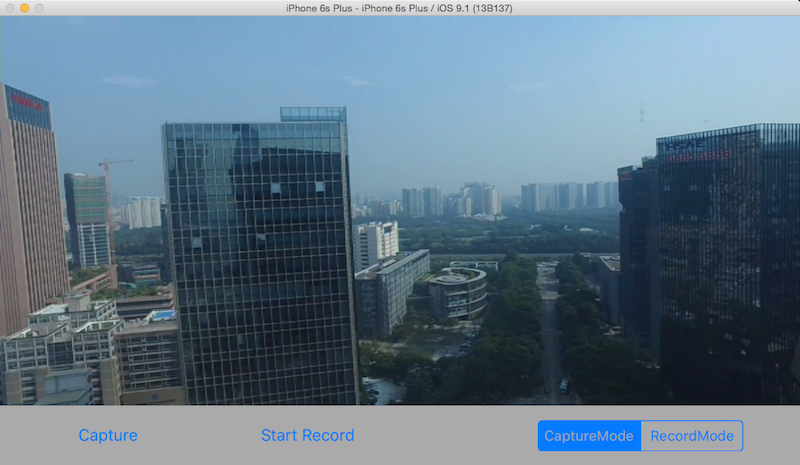 Now build and run the project in Xcode, wait for a few seconds, you will be able to view the live video stream from your aircraft's camera on your iOS simulator now! 1. If you cannot see the live video, please check the log message in Xcode's console and try to move your aircraft around the RC. The live video should show up. 2. You may notice that the live video has mosaics. 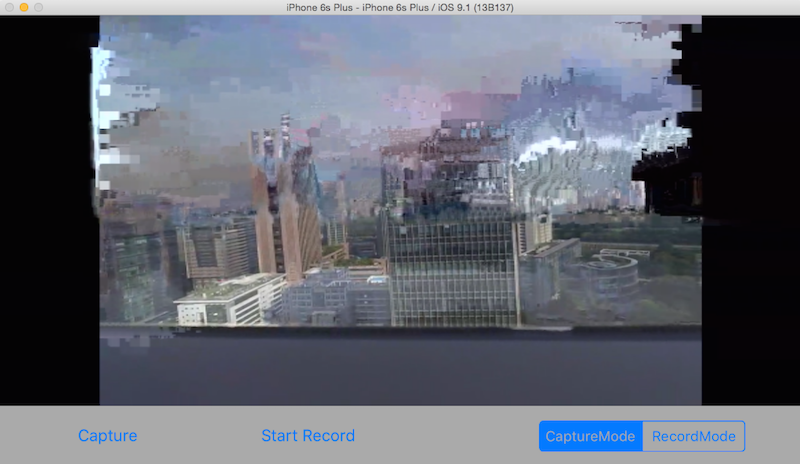 It's due to the delayed transmission and the software decoding quality of iOS Simulator. Congratulations! By using the bridge app, you can now debug your app with all the Xcode features, like adding Breakpoints in your code, using Instruments to profile the app, etc. Let's move forward. The delegate method above is used to get the camera state from the camera on your aircraft. It will be called frequently, so you can update your user interface or camera settings accordingly here. We update the currentRecordTimeLabel's text with latest recording time. Then, update the recordBtn's title with the correct state. Lastly, update the changeWorkModeSegmentControl's selected index with systemState's mode value. Currently, we are running the app on iOS Simulator. Although the iOS Simulator is extremely useful during app development, when you want to ensure the required functionality and performance of an application, such as App Memory Usage, Hardware usage like Accelerometer, Gyroscope, etc, testing on an actual device is still required. For more difference between iOS Simulator and actual iOS device, please refer to iOS Simulator Vs. Actual Device Testing . The good thing is DJI Bridge app supports actual iOS device debugging. You can find another iOS device, like an iPhone 6, iPad air 2, etc, and connect it to your Mac. Then build and run the project on it. It should work perfectly the same to the iOS Simulator. For the Phantom 3 Standard and OSMO, you cannot use DJI Bridge App to debug your application because they use WiFi to connect between your application and the remote controller or the handheld device. As the code shown above, if you don't want to use debug mode of the SDK with DJI Bridge app, you can call + (void)startConnectionToProduct; class method of DJISDKManager instead once the app registration is successful. 1. 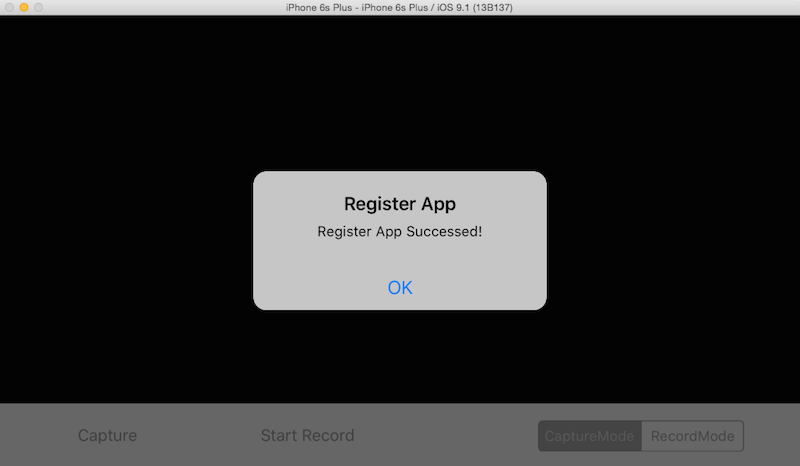 If it's the first time to run the application, which isn't registered before, you may need to connect your Mac or iOS device's WiFi to the internet and build and run the app for registration. Next time, you can connect their WiFi back to the DJI Product to debug without problems. 2. You may notice the video is clear without mosaic. Because the iOS device use hardware decoding for live video, which is better than software decoding. Congratulations! 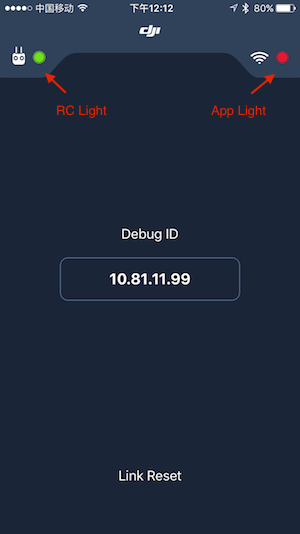 You've learned how to use DJI Bridge App to debug your application using DJI Mobile SDK. Also, for better understanding, the tutorial shows you how to show the live video view from the DJI Product's camera and control the camera to take photo and record video too. With DJI Bridge App, you can build your application with DJI Mobile SDK more efficiently. Hope you enjoy this tutorial, Thanks!